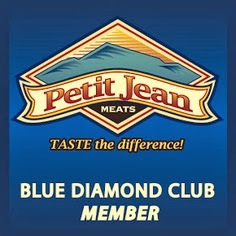 Burger Joint of the Week: 4Square Gifts. Burgers come in many shapes in sizes, from tiny sliders to the humongous Ed Walker's five pounder. Most are beef, though some vary into different grounds, such as the Buffalo burger at Jasper's Boardwalk Cafe. Some are served on sesame seed buns, others not. Many come with cheese or have it available. 4 Square Gifts in the River Market offers its own burger, complete with a slightly sourdough bun, Cheddar cheese, sweet caramelized red oniions, fresh green leaf lettuce and tomato and chipotle aioli. Yet there's no meat component. 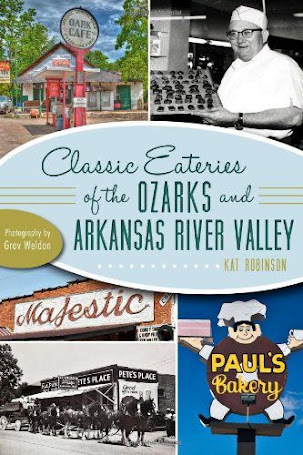 My dining companion and I dropped in for lunch a short time back, eager to enjoy a meatless meal together and to explore the Arkansas gifts throughout the store. 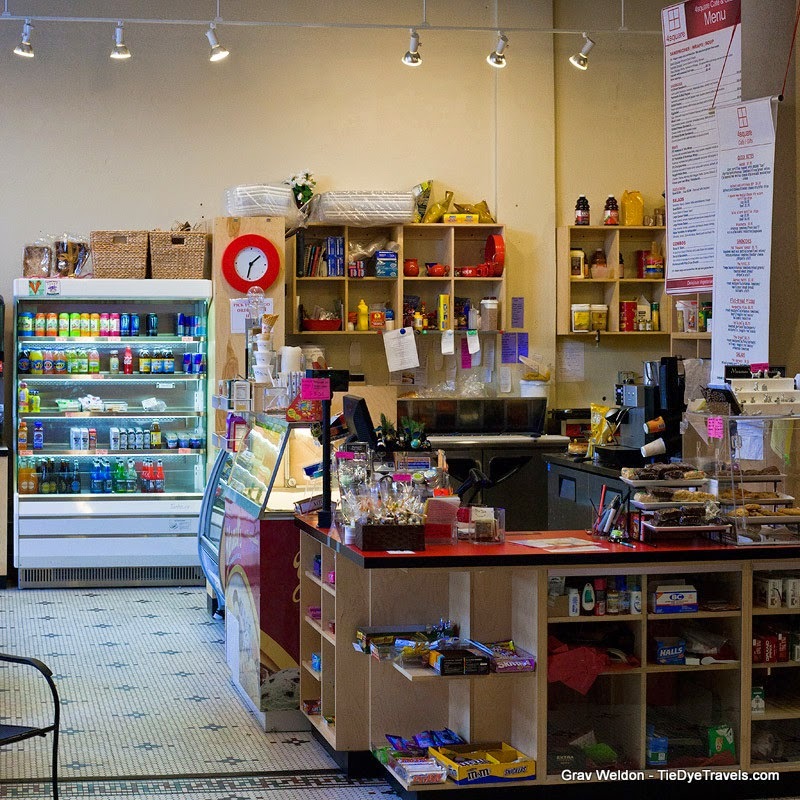 4 Square is such an inviting place, with high ceilings and big windows, a nice place to share sandwiches while sitting on stools in the sunlight reflected off the Oppenheimer Hall across the way. 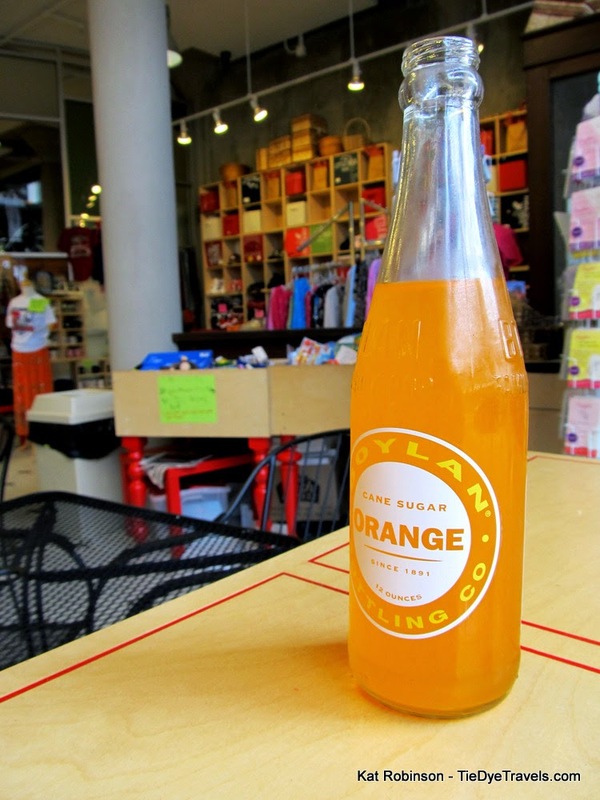 They offer so many items I like to see in a lunch joint, such as a wide selection of beverages ranging from juices to milks to high fructose corn syrup free Boylan Sodas. 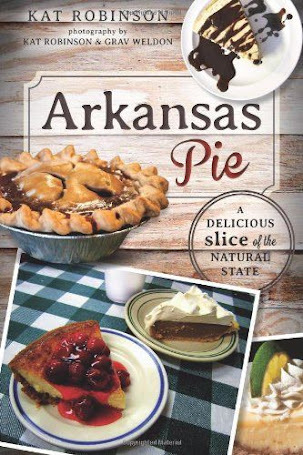 There are usually items you can pick up and run with (after paying, of course) in the cooler, and slices of pie as well. But we were in the mood for a hot lunch. My dining companion hadn't been there before and was concerned that whatever we ordered would not be enough to sustain us throughout the afternoon, so we agreed to order hummus and pita chips with our selections. notes of ginger and a touch of fenugreek. I suspect the hummus that lined the tortilla was of the red pepper variety. oatmeal. 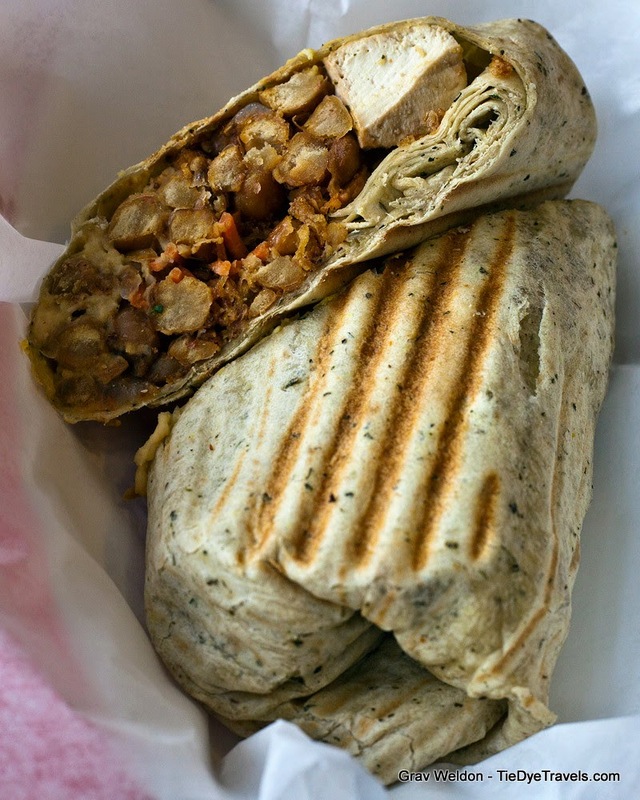 The wrap had the advantage of being marvelously filling, and my dining companion took half of it away to eat later. 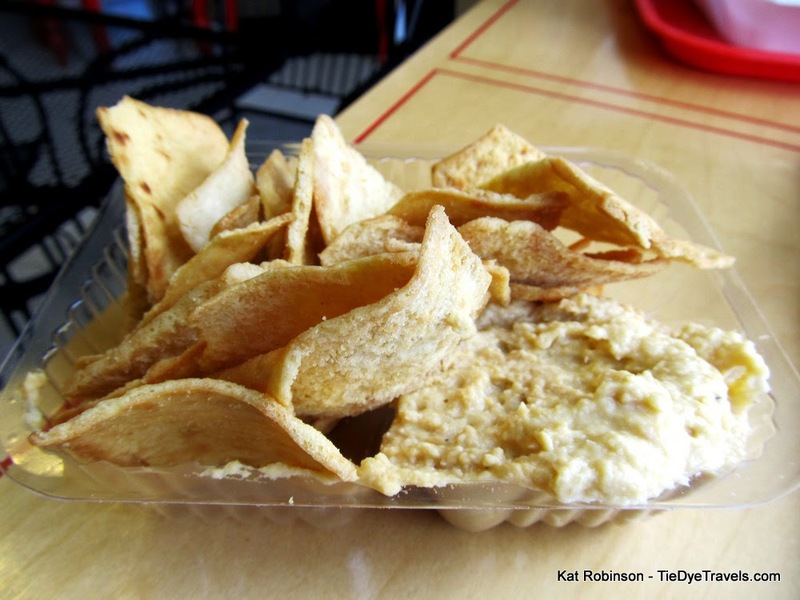 Our hummus ($3.25) shared was pretty standard but with a nice citrus note that gave the concoction a pleasant bite. It was served with pita chips. We had originally considered the Spinach and Artichoke Dip ($6.50), but it was out that day. So, the 4 Square Burger. $8.75 initially sounded like a bit much for the burger, but the menu did not mention it came with roasted red skin potato wedges, delightfully seasoned with salt, pepper and parsley. The burger itself was a marvelous surprise; on first bite it gave the same sort of mouthfeel I have become accustomed to in my burger quest. While lacking the traditional caramelized crust formed when a burger hits a griddle, this patty did have enough of a crust to it to give the impression of a crust-bite. 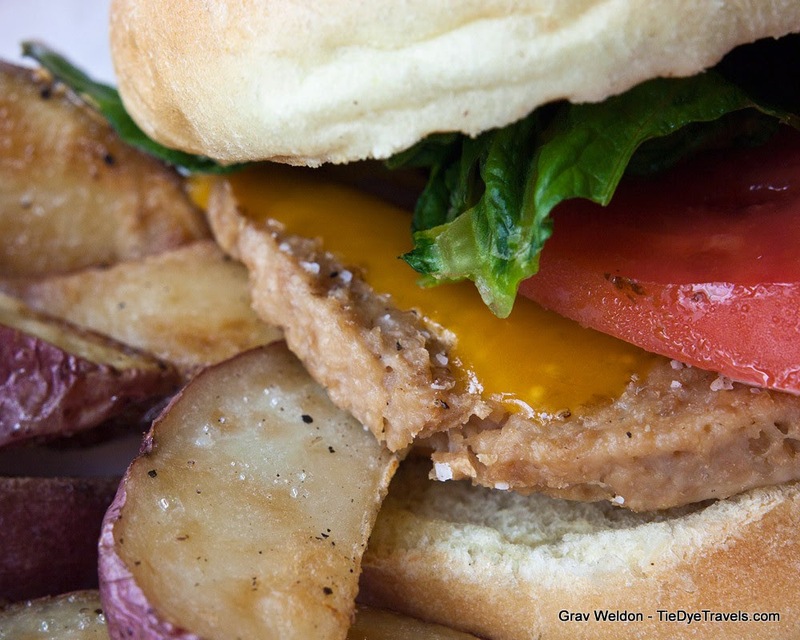 It was of a bean and tofu base, I believe, though I may be missing one of the patty ingredients. It was nicely flavored with onion powder and garlic... in fact, as the burger was consumed even more of the garlic flavor came through. 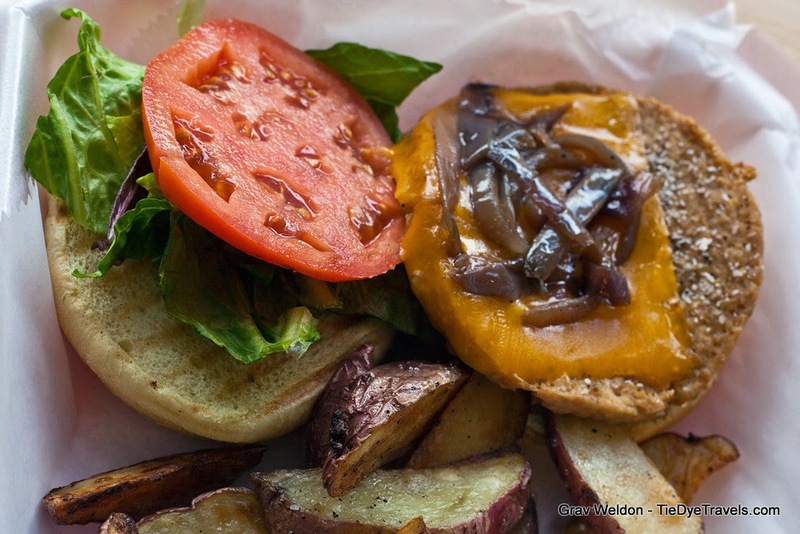 The Cheddar was just salty enough to give the burger its balance against the sweetness of the caramelized onions. The aioli was a little sharp at times, but not too sharp. In all, this is a well thought out sandwich. When it came time to go, it was no work at all to pack our leftovers, since everything had been presented to us in biodegradable cartons in the first place. My companion and I were both left with afternoon snacks after our meal. I can in all honesty say it was a good value. Does it make burger criteria? That... is a matter of opinion. I think it does, just as much as The Root Cafe's excellent Mushroom Burger or one of the great black bean burgers at The House. It may be time to re-examine what really constitutes a burger, and place garden burgers such as this firmly in a new category to be explored. I will be interested in seeing how many other non-beef burgers make the cut. 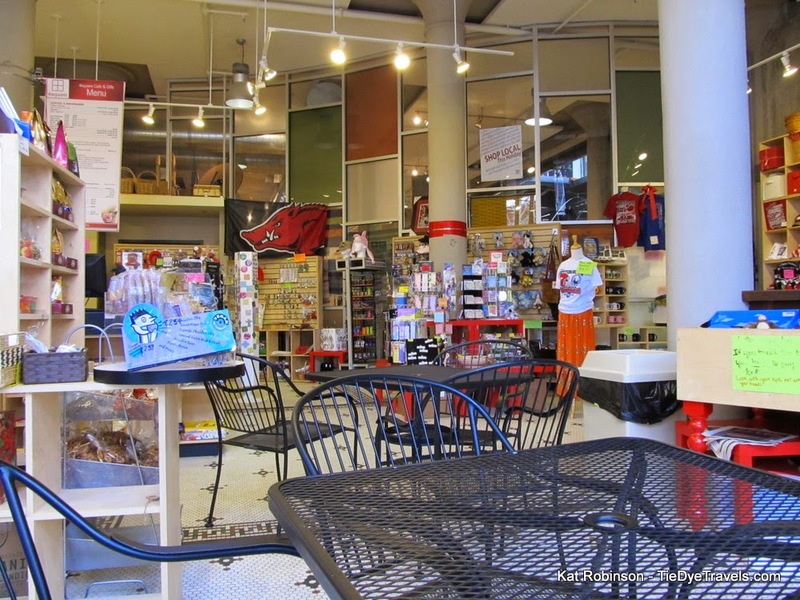 You'll find 4 Square Gifts at 405 President Clinton Avenue in the River Market in downtown Little Rock. It's open at 9:30 a.m. Monday through Saturday and 10:30 a.m. on Sunday, and closes at 7:30 Monday through Thursday, 9 p.m. Friday and Saturday and 4 p.m. on Sunday. 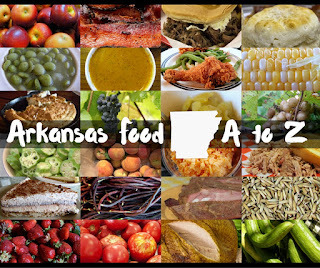 Check out the website or call (501) 244-2622. 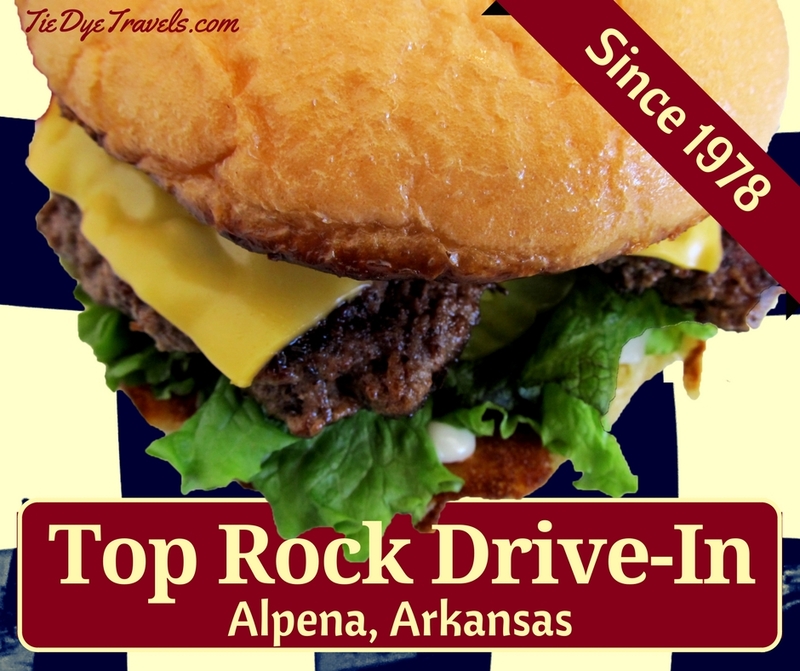 Burger Joint of the Week: Top Rock Drive In, Alpena. 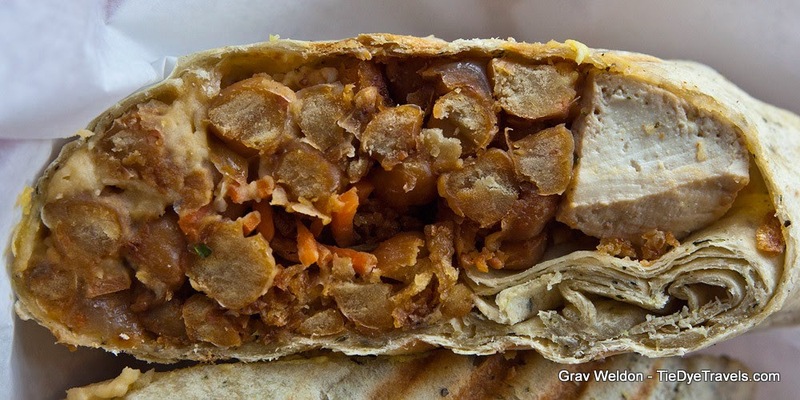 The first thing to note about the Leopard Burger is that it isn't actually made of leopards. Nor is it spotty. In fact, the only reason behind the name of the enormous burger offered at Top Rock Drive In up in Alpena is the name of the school mascot. Still, there is a bit of relief to be found in the fact that no cats were harmed in the creation of this burger. But I will tell you there was a lot of frying involved. 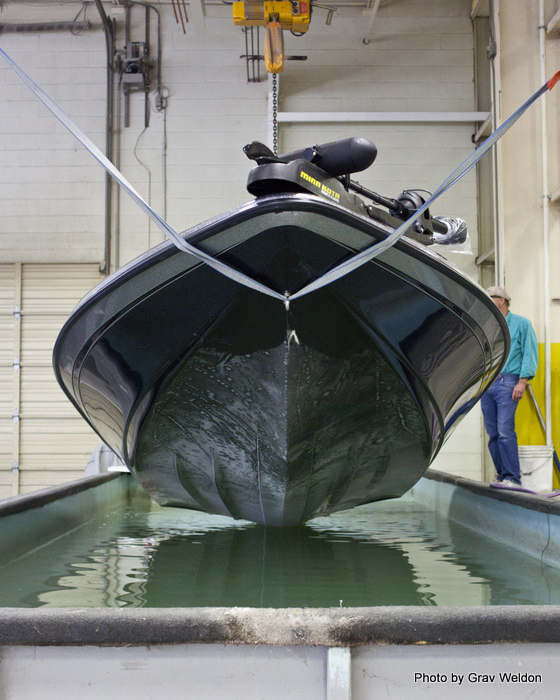 Ranger Boats: The Little Flippin Shop Makes Most of the World's Bass Boats. Getting ready to purchase that boat at one of the big shows this season? 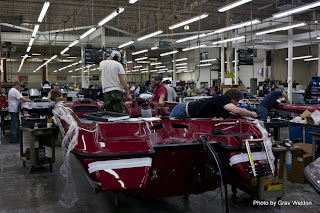 Chances are, if you’re buying a bass boat, you’re about to buy a Ranger -- or one of the other brands that come out of the Ranger Boat plant up in Flippin. The plant makes 72 percent of the bass boats sold in the world, plus walleye and pleasure boats, every one of them custom made by hand. 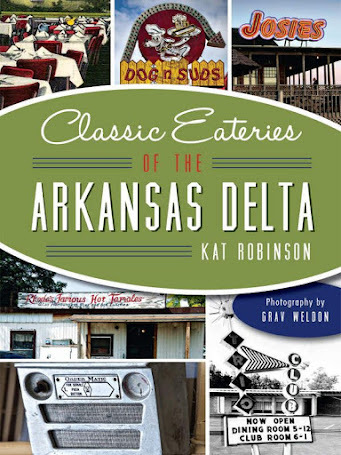 Take a tour with us and learn more about this north Arkansas enterprise. It started in 1968 in a garage on Main Street. Forrest and Nina Wood ran a guide service on nearby Bull Shoals lake. The Woods saw the value in making the then heavy, clunky wooden boats used on the lake and on the White River less weighty, more maneuverable and easier to handle. 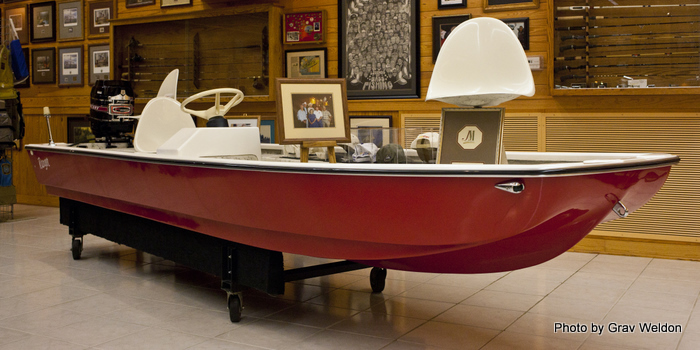 They and his brother Mickey set up shop in a garage on Main Street and made six fiberglass boats that would be the first boats to carry the Ranger name. The Woods bought an old nightclub on the outskirts of town, the Silver Star, a former stop-in popular with the workers who built Bull Shoals Dam back in the fifties. There they expanded the operation, building 600 boats in 1969 and doubling that in 1970. Boats were $1000, complete with lights and steering. On May 4th, 1971 fire consumed the plant. The next day some 40 orders were salvaged from an old desk. Several dealers offered to pay for their boats in advance to help fund reconstruction, and friends and family helped clear the slabs. 40 days later, the new plant was in operation. Ranger Boats started at a time when Americans were turning to the water for fun and pleasure. The innovations that came out of Flippin became industry standards. Ranger became the go-to boat for tournament fishing, especially with Bassmasters and with the operation previously known as Operation Bass -- which was renamed FLW for Forrest L. Wood’s initials. Wood sold Ranger Boats in 1987, but the family remains tight with the company. I took a tour of the facility with Mickey Wood, Forrest Wood’s younger brother, and learned a lot more than I thought I would ever know about bass boats than I ever thought I might absorb. Mickey Wood was at the front desk of the headquarters building when I walked in the door. We shook hands and he asked me what I wanted to know. I told him I was along for the ride and to share whatever he thought was pertinent. We headed over to the plant next door in his truck. Past the break room up front we went right into the plant, an operation that seemed to span out a mile in every direction. I followed him through the noise straight back to a section where there were a sea of boat hulls on rolling racks. This is where boats begin. Each one begins as two parts, a fiberglass hull and a fiberglass deck. 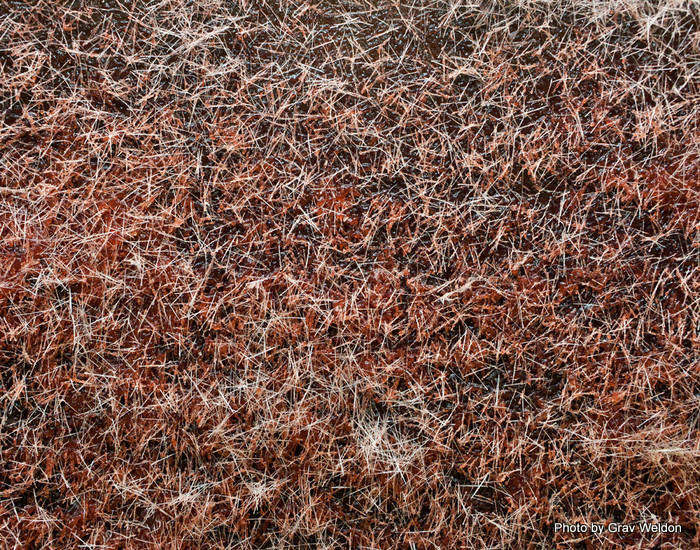 The paint and fiberglass process takes 48 hours to complete. 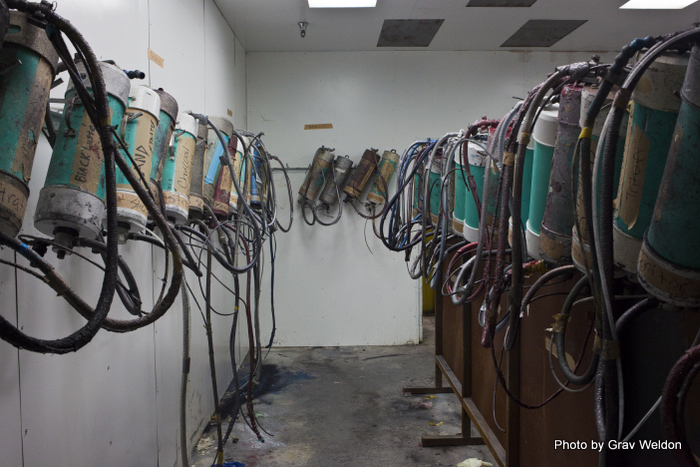 The molds themselves take six days to make. They’re created from wooden plugs and are designed these days by CADCAM designers, though back in the day they were carved by hand. The plug is then cast in fiberglass, which becomes a mold. 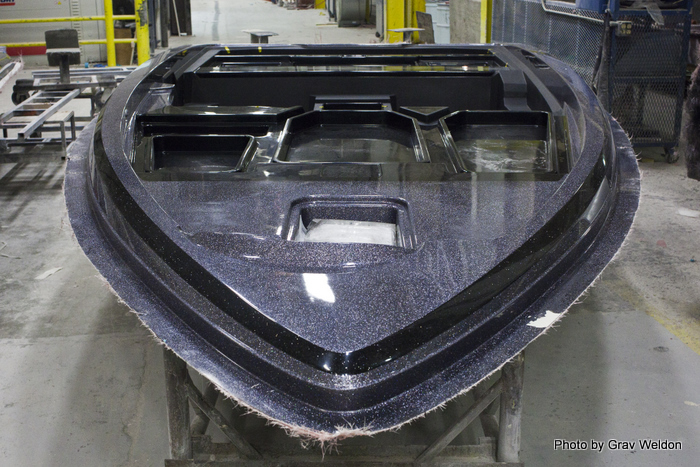 Each model requires a hull and deck mold to be made, and the process to bring that concept to reality can cost a half million dollars before the first boat is even assembled. 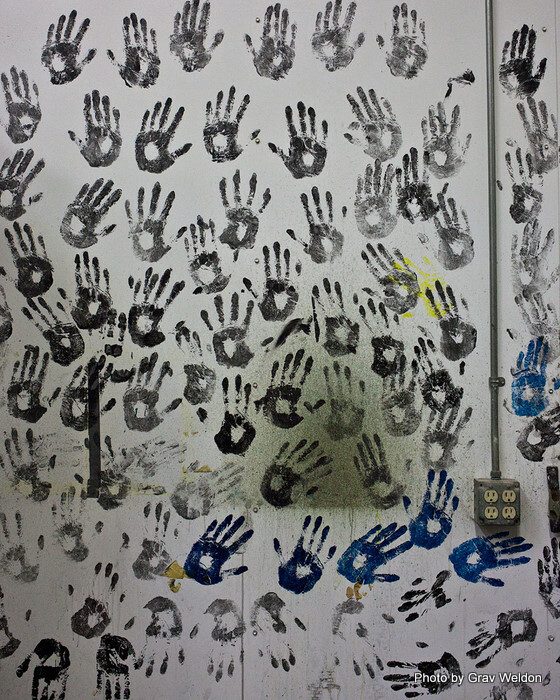 The "Indian Hand Signals" left by workers. directly into the molds, layer after layer, the details of the custom design taped off and sprayed down. You’ll never have to worry about that trim coming off, either -- since it’s part of the actual coat of the boat. The deck is the same way, and those deep and shiny bright colors are also sprayed into a mold that will eventually be reversed and attached to a hull. 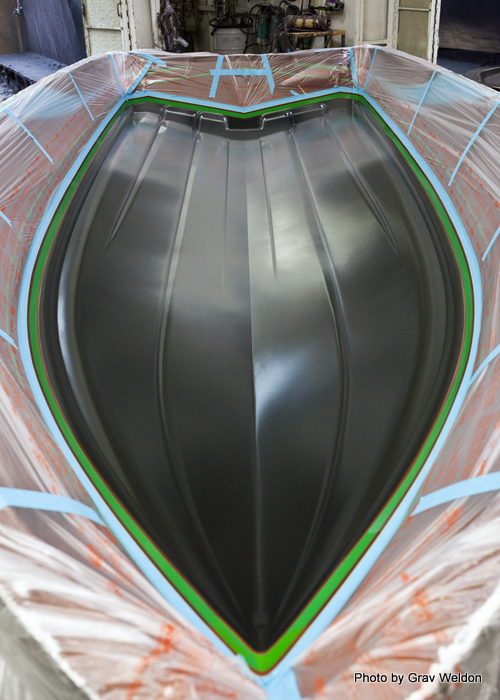 Every layer of paint goes into the mold before the fiberglass is applied, to give the best definition of every detail. The next step is the first application of fiberglass. Inch-long fiberglass threads are mixed with a catalyzing agent and a resin and applied to the mold. The cobalt and peroxide resin covers the inside of the mold, dries and becomes a virtually unbreakable solid in a matter of hours. The plant will utilize about 7.5 million pounds of fiberglass thread this year to create these boats. We watched as a series of crews handled several boats. One team sprayed down a deck with the fiberglass mixture from a special nozzle. The next team went over the deck with brushes and fine tools to make sure the mixture had made it into every nook and cranny in the mold. Another crew was fitting yet another deck with reinforcements, which were in turn sealed in with another layer of fiberglass and gone over by a team with more fine tools. They’re not all Ranger brand boats. Four brands are built here. Ranger, of course, but also Triton, Stratus and Champion. When the boat market began to sink a few years ago, Ranger acquired these other brands and brought them to Flippin. Each one has its own specifications, but every one has to meet the high quality standards set by the Woods. We passed alongside more boats in further states of construction, with even more layers of reinforcement and fiberglass added. Some already had tanks attached, live wells that allow circulating water to keep fish from expiring before they’re brought in to shore. At the end of the third line, there’s a big metal frame overhead. Workers attach each deck to the frame, pull it out of the mold and invert it. It goes back on a rack and keeps being moved along the line. Ranger only makes fishing boats -- bass, walleye and multi-species. Some boats are strictly for fishing, others for pleasure… really, it’s up to the consumer. Each one is custom made. If you want a Ranger Boat, you go to the dealership and place your order. There may be a floor sample that the dealership ordered -- but even that boat was custom made for that location. “An eighteen and a half footer with a 250 horsepower motor, with two people and tackle? 78 miles an hour,” Wood said. 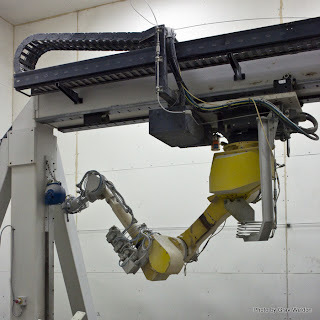 We came at that point to the only robot in the entire plant -- a special machine that cuts out every little indentation, every live well access, every place a hose or a tank goes in with water shot from a high force nozzle at 6400 psi. 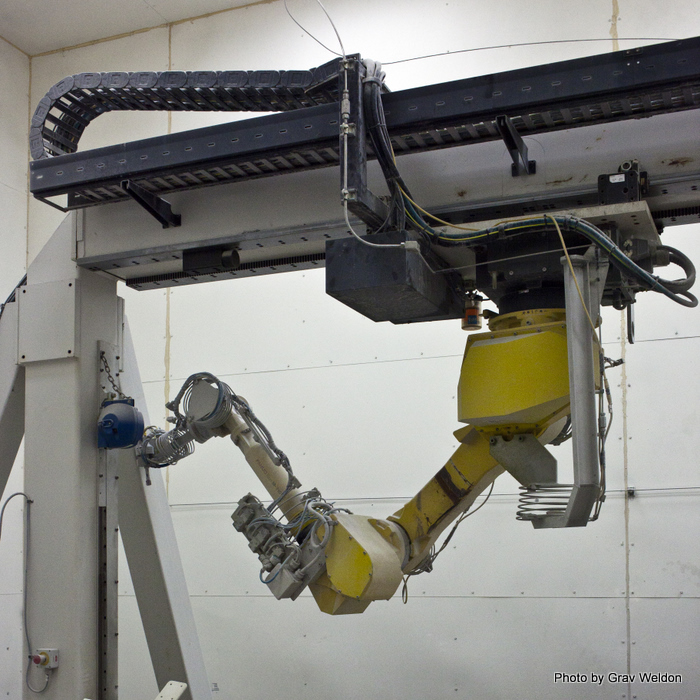 It’s all programmed into a computer by one of the guys at the plant… and it’s done this way for the utmost accuracy. 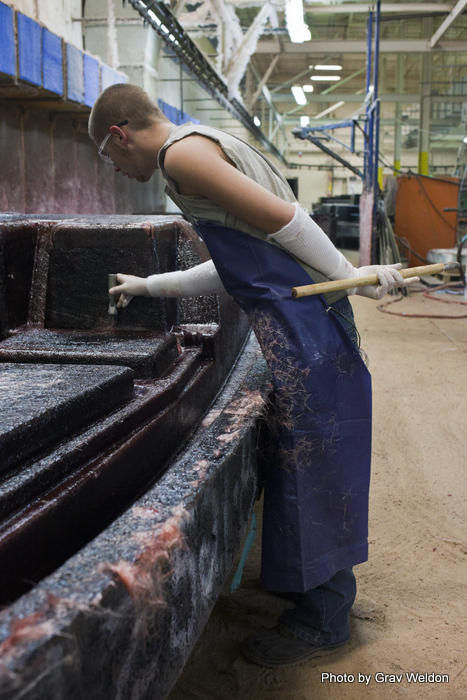 From there, we walked back further into the plant, to an area where the hulls are painted and processed. Though the type of fiberglass is different here, the hulls go through the same sort of process as the decks over a 48 hour time period. 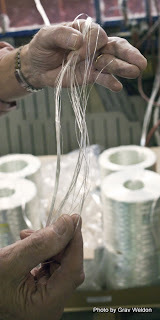 The biggest difference is in the type of fiberglass strands employed in the composite construction. 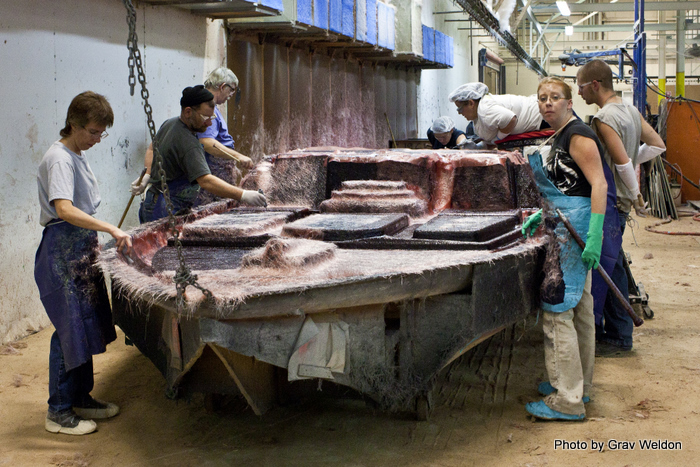 Within the fiberglass layers in the hull molds, woven robing is placed. 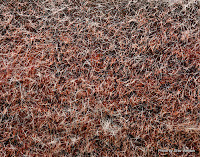 This 24 ounce dry fiberglass fabric is impregnated with resin to create an almost impenetrable hard coat. After several applications of fiberglass and several finishing rounds, the hull is completed. Once it’s dry, it’s paired with its deck. A big yellow frame is used to pick up the deck, slide it over to the hull and carefully drop it into place to be permanently joined. This is when any additional component between the hull and deck is added. For instance, in the Ranger brand boats, there’s a certain type of foam that’s pumped between hull and deck to make it even more unsinkable. The other boats made at the plant have different procedures and different materials -- but once again, it’s all made to far surpass Coast Guard regulations. The gas tanks are added at this point. Each gas tank holds between 30 and 60 gallons of gas -- which may seem like a lot, until you realize that the average boat won’t get you the sort of mileage on the water you get on the road. You think your car gets bad gas mileage? Boat motors tend to get fewer miles to the gallon than automotive motors. Factor in the resistance of the water and it all makes sense. A two stroke motor gets about four miles to the gallon, while a four stroke gets about six. There are also kicker motors -- smaller motors useful in hitting the exact spot or maneuvering once you find your exact location. Speaking of motors, they’re attached at this point, too -- whichever type the model calls for or the customer asks for -- be it Mercury, Yamaha, Evinrude, Honda or Suzuki. Other bits are added at this point too -- rub rails, dials and fittings all go in before the boat is sent on to the finishing room next door. Boats aren’t just a means to get where you’re going on a lake any more. 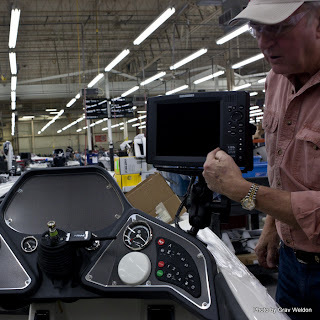 Ranger Boats are fully integrated into the 21st Century with top of the line fish finders, GPS onboard satellite locators and all sorts of computers. 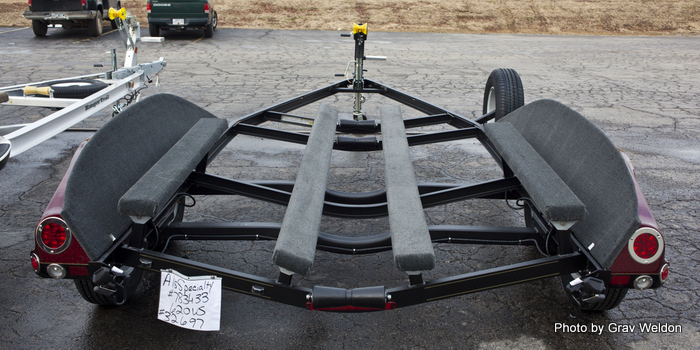 You can easily sink thousands of dollars into your boat with these custom additions. But people order them. There are other add-ons, too, like these boat anchors that sit on the back of the boat on either side of the motor. Instead of the traditional weight-on-a-rope, these are long fiberglass poles that telescope downward to the bottom of the waterway. There are two so you can also hold your position at the same time. Then there are roofs -- yes, boat roofs, T-tops to keep the sun off your face and neck. They’re more often added to pleasure crafts, but I saw a few being fitted to tournament boats as well. After each boat has been assembled and before they leave the plant, each boat is subject to a water test. They’re submerged in a water tank and the pumps and electrical are tested. If there’s anything wrong, the boat will be deconstructed back to the point where the error can be fixed, and then they’re rebuilt. Wood says they’ll go as far as they have to, to fix a problem before a boat is sent out. Everything is checked -- the clamps, the live well, even the radio. Once the boat is finished and checked over, it’s introduced to its custom built trailer. The trailers are built to accommodate each boat -- aluminum trailers for saltwater boats and channel tube for freshwater boats. 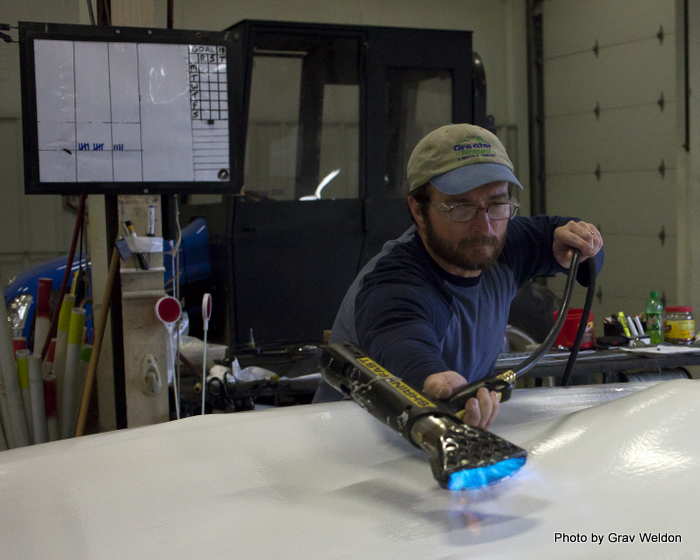 They’re designed to perform well at any speed limit and come with similar gel coat and flair to each boat. 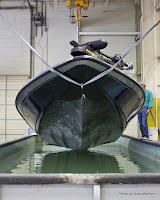 Once the boat’s on the trailer, a shrink wrap is applied and the boat is ready to go. Most of the boats are sent to the dealership from whence they were ordered by one of the trucks in Ranger’s fleet -- but sometimes a customer wants to come pick up a boat himself. 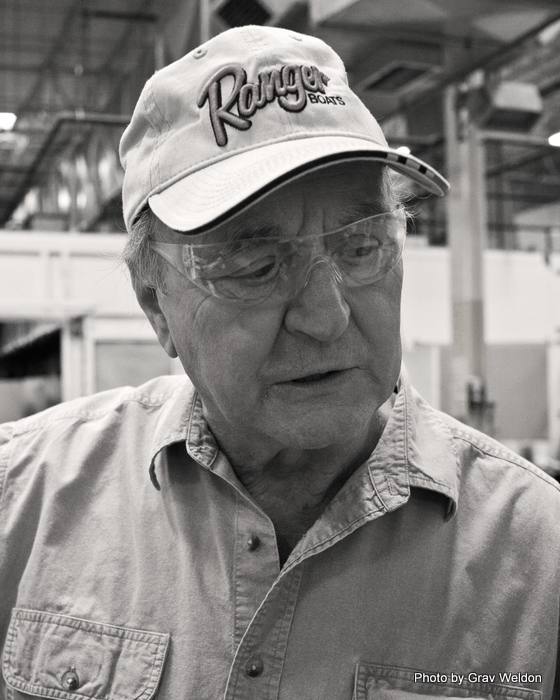 Mickey Wood told me about a gentleman from New Jersey who drove down to the plant to pick up his boat. He says the guy had just arrived about the same time the boat came off the line. It’s like getting a new car, or even better. The plant will make about 4500 boats this year. That may not seem like a lot -- until you consider the number of people who own a boat. Most folks who purchase a boat purchase it for a lifetime. Boats are handed down through families. 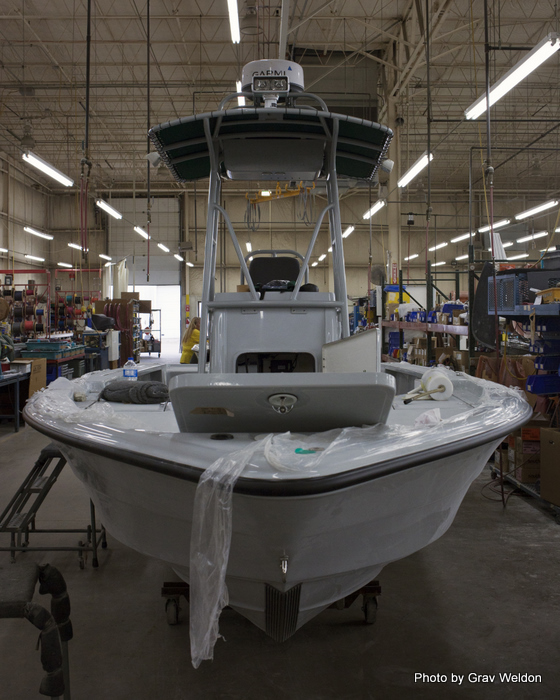 Few buy more than one boat -- with the exception of pro fishermen, of course. It’s an investment, but if you take care of a boat it can easily last you a lifetime. That means waxing the hull, properly winterizing the boat and just being smart about boat care. 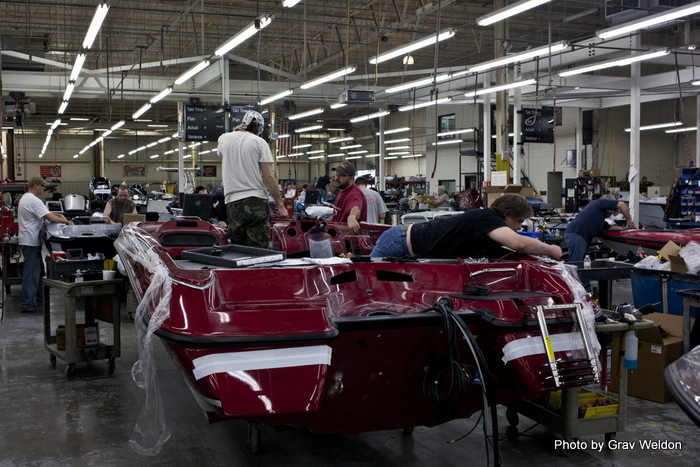 64,000 boats were made market-wide five years ago, there will be just 9000 new boats made this year. 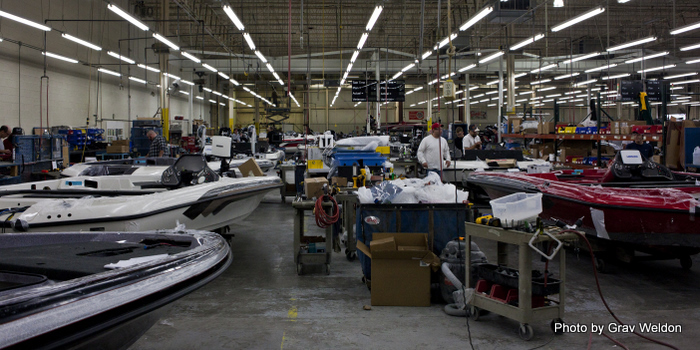 Half of those boats come from Flippin, and Ranger Boats comprise 72 percent of the bass boat market worldwide. The recession has taken its hit here. Just a few years ago the plant was running 24 hours a day, three shifts of workers hauling tail seven days a week to keep up with the demand. But then the bottom fell out of the market. Ranger was lucky -- and smart. By acquiring other brands the plant has been kept busy, and layoffs have been stymied. Today workers operate in two shifts over five days a week and are just able to keep up with the demand. The little boat-making operation has come a long way, and it’s guaranteed a great future for the Flippin community. Thanks to good decisions and a great product, Ranger Boats should be around for a long time to come. At every major bass tournament -- and a lot of the smaller ones, too -- you’ll find the Ranger repair team. Mickey Wood says the team helps get every boat -- not just Ranger Boats -- back on the water. He says it’s a simple philosophy. TV show “The Fishing Hole,” the longest running fishing program in television history. Today the boat Jerry McKinnis used in the early days of that program resides at the Forrest L. Wood Outdoor Sports Gallery, just south of the Ranger Boat facility in Flippin. lives in Flippin, having fallen in love with the area. Each year, thousands of Ranger Boat fans pass through the museum while they’re in the area, whether it be for vacation or a tournament. It’s open Tuesdays and Thursdays. 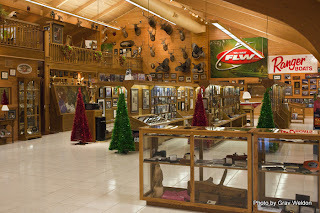 The two-story gallery features hundreds of magazine covers heralding Ranger Boats, plus all sorts of memorabilia and a taxidermy collection. It’s something to see. 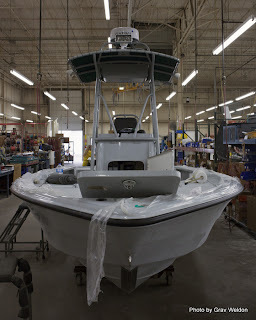 For more information on Ranger Boats, check out the website. There's also a website for the museum.